I went to a demo yesterday at Microsoft where I actually got to see Microsoft Office Web Apps live for the first time. Wow! Even better than I’d imagined. After the demo was over I was real disappointed because I thought that I’d have to wait until Office 2010 get released on May 12 to get a hold of Microsoft Office Web Apps. WRONG. you can download a beta copy, which is exactly what I’ve done. Here is a brief installation overview. 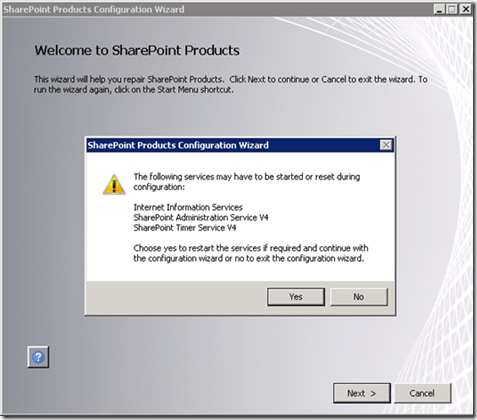 You need to have SharePoint 2010 installed and operating on a server. Once you have downloaded the file package double click it to run. You will then be asked for the license key (which is found in the documentation link above). Wait for package to copy files. 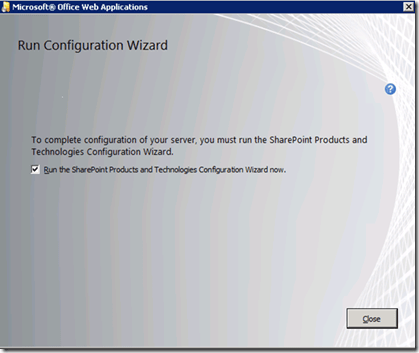 Run the SharePoint config wizard. A few services get restarted. 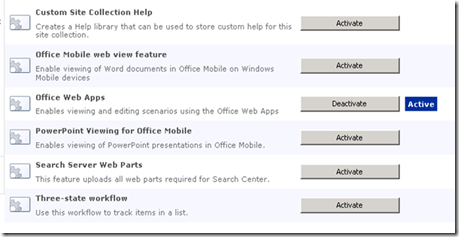 Office Web Apps gets configured. All done with install, now for configuration. 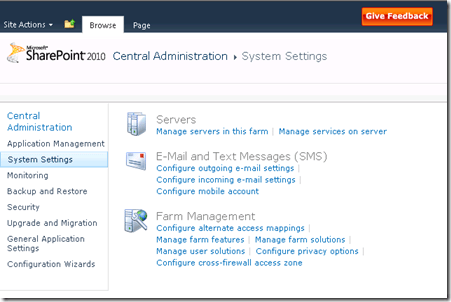 Go to System Settings in SharePoint Central Admin and select Manage services on server. Ensure Excel, PowerPoint and Word Services are running. Got Application Management then Manage service applications. 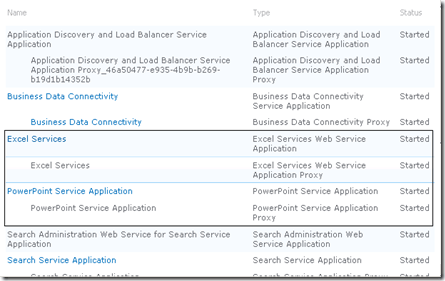 Make sure Office Web Apps services are running. 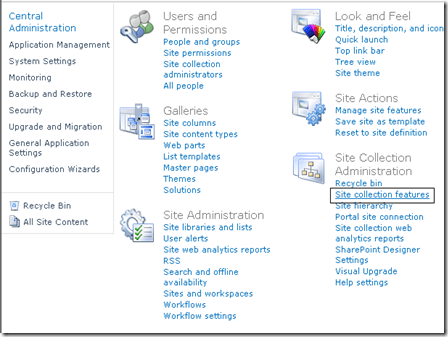 Now go to the Site Settings for your SharePoint site. 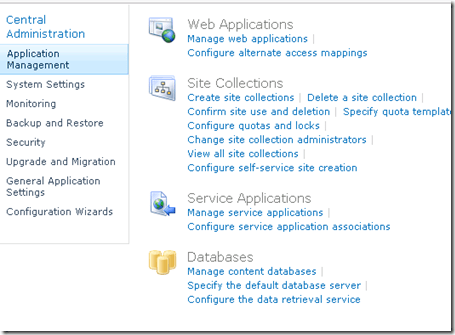 Locate Site Collection features under Site Collection Administration. Find Word doc on your site and click it to open. 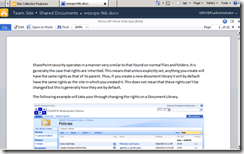 Bamm – Word document in a web browser courtesy of Office Web Apps. I am impressed. More testing to come soon. So it seems that when you buy Office 2010 you also get the ability to install Office Web Apps onto something like SharePoint Foundation. So there is no additional product to purchase or download! – Office Web Apps include Microsoft Word Web App, Microsoft Excel Web App, Microsoft PowerPoint App and Microsoft OneNote Web App. Most importantly here is the fact that there will be an Office Web App for OneNote. Yeah! This means that you can read OneNote files without necessarily having to have OneNote installed on your desktop. Ah ah. 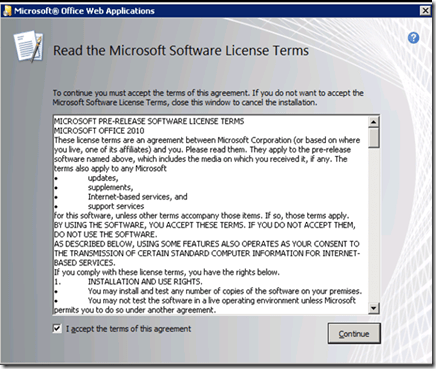 So to obtain Microsoft Office Web Apps you have to purchase Office via Volume Licensing. This makes sense and means that for most businesses obtaining Volume Licensing is the way to go. Obviously price may be an issue but that aside Volume Licensing does provide many benefits, even to smaller businesses. 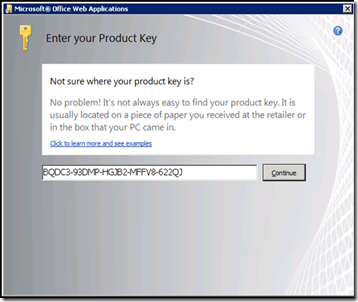 What Web Apps is NOT – Not to be sold as a standalone product – included with Office license. Most interesting. So when you buy Office via Volume Licensing you automatically obtain Office Web Apps – neat. This whole concept of Office Web Apps opens a huge range of possibilities in my mind. 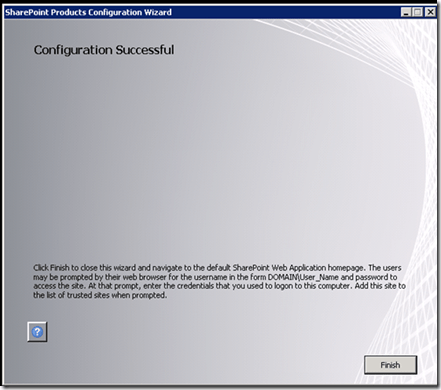 It certainly indicates that Windows SharePoint Foundation 2010 is going to be far more important if it is seen as the host of Office Web Apps inside a business. 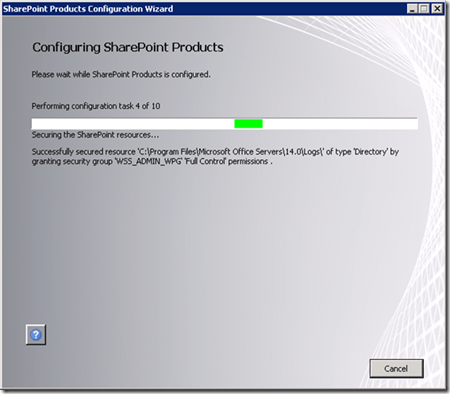 This means that once you purchase Office via Volume Licensing you can download SharePoint Foundation 2010 for free and install Office Web Apps there and then run them via a browser rather than installing the software on workstations. If you did this, it would mean only a single location to maintain updates and provide all users with consistent versions in theory. I would also assume that if you allowed remote access to your SharePoint Foundation 2010 server then you could run Microsoft Office via a web browser and any Internet connection, which would be pretty cool when you think about it. There are still plenty of questions around all this Office Web Apps stuff such as how it handles licensing, how it is installed, where it stores data and so on because, to my knowledge Office Web Apps isn’t available yet. However, what it does indicate to me is that, most importantly SharePoint Foundation 2010 is going to be a very important part of most businesses infrastructure going forward. So if you don’t know SharePoint, I reckon you better start learning. 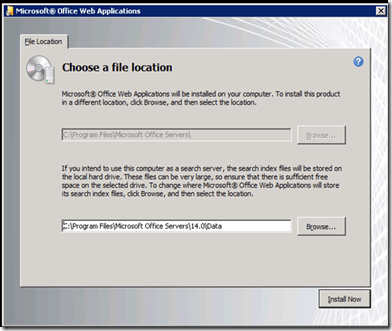 I can also see the application of Office Web Apps into things like Microsoft Business Productivity Online Suite (BPOS). This means now that BPOS will almost offer a complete desktop replacement of applications that users are familiar with. It is certainly further evidence that Microsoft is transitioning more to the cloud and considering what Office Web Apps may offer I’m more positive that it is a good strategy, even down to the SMB space. 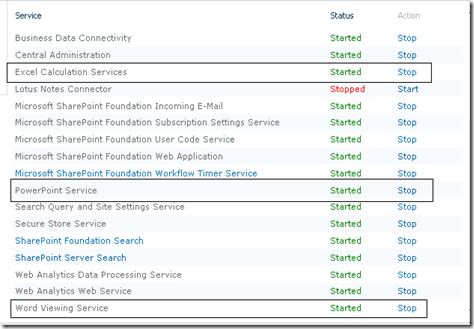 The next steps for me are to find out more about Web Apps and how to get them running on SharePoint Foundation 2010. 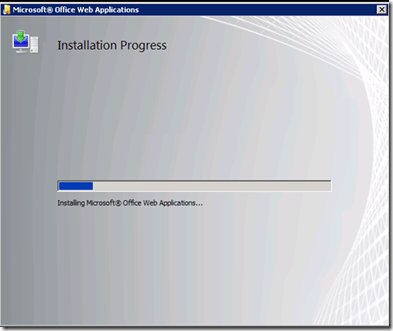 I guess I’ll have to wait till when Office 2010 is released to get may hands on Office Web Apps. Damm. With Office 2010 due out in May now is probably a good time to spend getting up to speed on the product. Remember that this new version of Office includes a number of very different features including an online and a free version. That’s also apart from all the other new features with the individual products themselves. 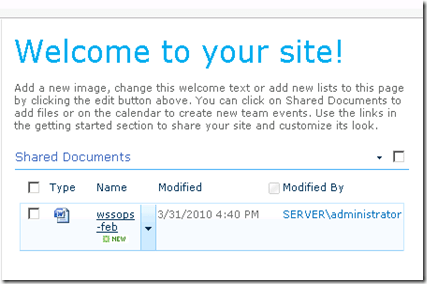 Probably the biggest change in SharePoint 2010 is the interface which now includes an Office style ribbon. In many ways it is probably going to be like how the Office ribbon was accepted by users. At first they hated it, mainly because it was different, but then after a while they found that it actually made things easier. Then they loved it. I reckon it’ll be the same with SharePoint 2010. 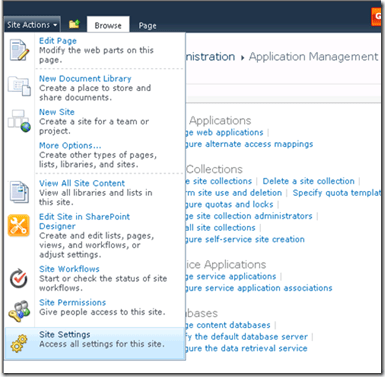 I think that the new ribbon interface will also improve the acceptance and usage of SharePoint because it is less like a ‘boring web site’ and more like a true ‘web app’ now. I also think that making it more like Office is also a winner. Initially I was sceptical but now the more I see it and more I use it I think that it does really make sense. The main reason is that, as I have always said, SharePoint works best when combined with office. It is totally online and takes about 60 minutes to complete and if you are planning on using or working with SharePoint 2010 then I highly recommend you take the time and complete training. 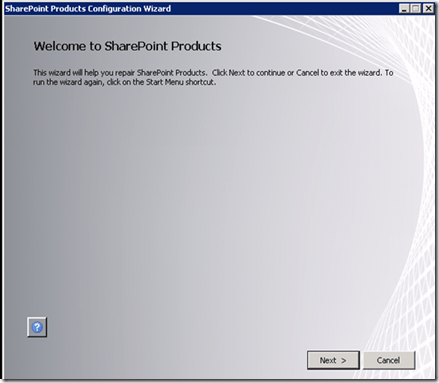 If you know of any other good SharePoint 2010 training let me know (director@ciaops.com) so I can tell people. With thanks to Susan Bradley who put my name forward for this, I’m happy to say that I have recent featured on the RunAsRadio program. Show #152 Robert Crane Manages Sharepoint 2010! can be download via a number of different audio formats for you to listen to at your leisure. In the episode I speak generally about some of the issues around creating well managed SharePoint sites and some of the challenges that IT Professional may face with a SharePoint site in their environment. from Mick Huxley. Although he is a techie he is also a volunteer for the SES (State Emergency Services). Now this is basically a totally volunteer organization that provides a major amount of emergency and disaster relief. Interestingly, it seems that the SES has been given BPOS accounts. The trouble is that most people simply look at SharePoint and expect it to ‘magically’ do everything. You gotta mould to your needs and this requires some investment to get the most out of it. SharePoint is simply a tool, like Excel, you only get out of it what you put in. To me this is simply more evidence that BPOS and hosted SharePoint provide real solutions for any organization, commercial or not. As much as I am disappointed by the current lack of uptake of SharePoint I feel better when I see stories likes these from the front lines. I know that one day soon we’ll reach a tipping point and people will begin to recognize the benefits SharePoint can play in their organization. Today’s webinar, Learning SharePoint Lists, has been posted up on my YouTube channel. It contains about the first eight minutes or so of the full 60 minute webinar that was run today. <img src="http://lh4.ggpht.com/-dgv1kOgKRDE/UPYhdMO9cgI/AAAAAAAAHaY/5s20JfD61Do/videoc5ddac071e53%25255B4%25255D.jpg?imgmax=800" style="border-style: none" galleryimg="no" onload="var downlevelDiv = document.getElementById('d148eb1d-d00d-472b-8d78-57cf8e15a6e0'); downlevelDiv.innerHTML = "
If you have any feedback on the webinars, suggestions, or topic suggestions please don’t hesitate to email director@ciaops.com and I hope to see you at the next webinar. This means that the focus has shifted (rightly or wrongly) from infrastructure to cloud. This is where Microsoft is throwing its resources. Maybe Microsoft’s solution is half baked but that doesn’t stop them allocating their resources there. History shows us that Microsoft tends to start slow and awkwardly in many markets but eventually, usually through sheer brute force, they take a dominate stake. I see no reason why the same won’t occur here. Now you can quote me that this time it is different because of Google and guess what I totally agree with you. Why? Because it again reinforces my point that this online stuff, for better or worse, is not going away. The reality is that it is the traditional in house stuff that is. You shouldn’t need to ‘read the tea leaves’ as Susan says in her post, to see that markets generally go where the dollars flow and Microsoft is currently tipping its bucket into the cloud. To reap the benefits you’ll have to probably follow their lead because in the end it is their products that people sell and support. Technically, maybe the cloud stuff isn’t quite there but guess what that doesn’t matter because it is not the greatest driver here. Because the IT industry is being commoditized here major decisions are now based on cost. The cry is no longer ‘I want the best technology’ it has become ‘I want the cheapest technology’ because to the customer, most technology now looks identical whether it is delivered in house or from the cloud. Therefore in a world where there are few differences between products price becomes the differentiator and the cheaper one always wins. It would certainly seem that this is what we are seeing now.